Came across this while walking into work today. Always exciting to find 3 police cars, a fire truck, and a police line blocking your path. Anyone know what happened? 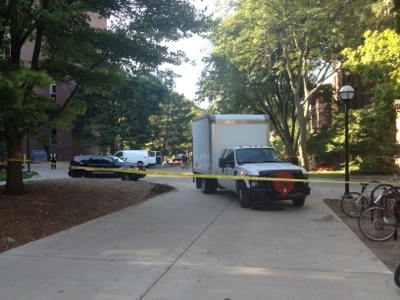 UPDATE: There is a gas leak on the east side of Randall Lab. The building has been evacuated and MichCon is en route.